Details for Studios 23 sq. m.
Comfortable and 'clever' choice for 2 or 4 persons small groups of friends and/or families with children, Two KG beds of 1,50m & of 1,30m width. Kitchenette, Refrigerator, Bathroom with shower cabin/wc, air conditioning, TV, free Wi-Fi internet, electric kettle, coffee machine, toaster, hair dryer, safe box and verandah with sea view. Details for Studios 27 sq. m.
Accommodation up to 6 persons. Two bedrooms - one KG, one twin -, two bathrooms, fully equipped kitchen with oven, full refrigerator, dinning area, lounge area, 3 air condition units, TV, free Wi-Fi internet, electric kettle, coffee machine, toaster, hair dryer, safe box, verandah and balcony with excellent sea view. Details for Apartments 70 sq. m.
At certain times through out the seasons we may have a selection of 'special offers', especially for early and last moment bookings as well as for stay of more than 10 overnights. Apart our price list please contact us to get an offer. All aspects of our visitor's comfort have been taken into consideration by giving careful attention to every detail in the resort. 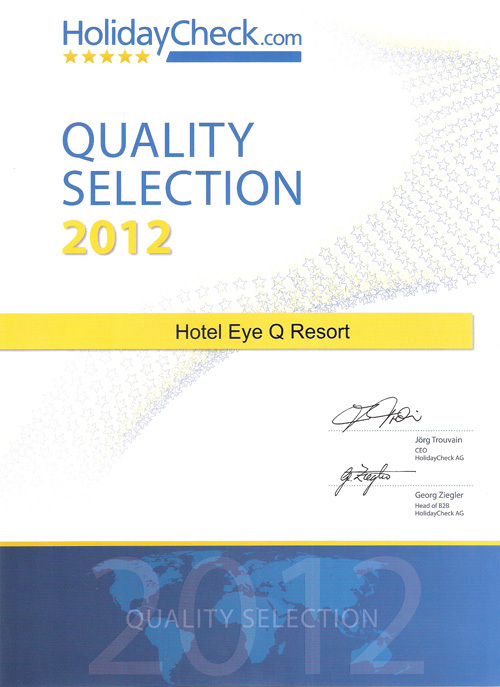 Eye Q Resort has been recognized for its well planned design features and has been awarded an 'A' Category rating. Eye Q Resort has been constructed and completed in spring of 2004. Our resort consists of four individually styled villas comprising of 4 apartments and 8 studios. Each apartment and studio may accommodate from 2 to 6 persons. 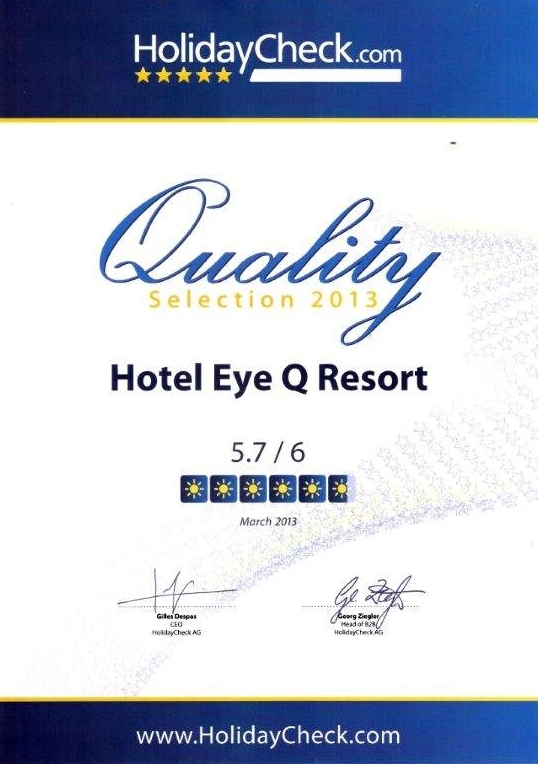 During the first eight years of operation, Eye Q Resort has been recognized both from professionals of the tourist market, as well as from all our guests - more than 50 different nationalities - exceptional, luxurious and of the very best ones on the island of Skiathos. Eye Q Resort has gymnasium, sauna and hydropool spa. All our guest can enjoy free of charge services of sauna and hydropool spa. Eye Q Resort is situated in the locality of the beach of Megali Ammos area. The area of Megali Ammos is the most preferable area for all visitors - tourists in Skiathos. There is a wide choice of taverns and supermarkets all within easy walking distance. On the beach of Megali Ammos you will find a variety of water sports available. Skiathos town is also nearby, a stroll of approximately 10 minutes. Eye Q Resort commands 'panoramic sea views' across the bay of Megali Ammos towards the Islands of Maragos and Arcos and in the evening... is totally Enchanting! The resort is surrounded by olive groves giving a secluded natural environment. Thank You For Choosing Eye Q As Your Holiday Resort in Skiathos.We wish you Happy Holidays. "With public sentiment, nothing can fail. Without it, nothing can succeed. "-Abraham Lincoln. Visit our guestbook and read the opinions of our clients. 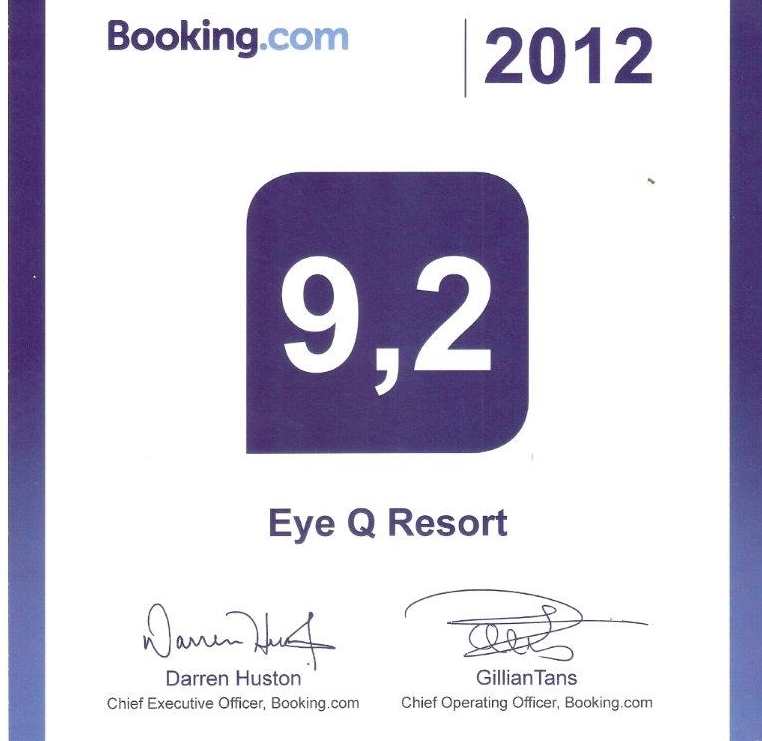 Please contact us directly to Eye Q Resort - Skiathos or through our Athens office. After we receive your request, we shall immediately revert and you will receive in written our offer. ©2019 - Prohibited the use or copying the contents of the site, with anyway, with or without treatment, without the written permission of the Eye Q Resort.